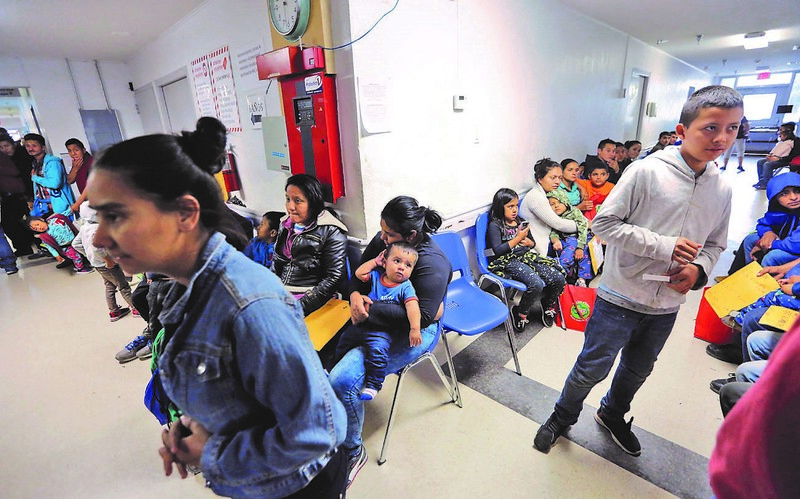 McALLEN — The last week was spent with local leaders attempting to care for mass releases of undocumented immigrants by federal authorities, resulting in additional facilities opening up across town to accommodate the immigrants. In addition to the immigrant respite center near the corner of Hackberry Avenue and Second Street, city officials, in coordination with Catholic Charities of the Rio Grande Valley and its director, Sister Norma Pimentel, utilized the Salvation Army building, a building on Beaumont Avenue and a church on Nolana Avenue. The respite center on Hackberry Avenue had received more than 800 immigrants daily early in the week, causing Catholic Charities and city officials to scramble to look for more space. This in addition to the cloud hanging over the respite center after city commissioners decided in February that Catholic Charities had to vacate its building on Hackberry Avenue within 90 days. Earlier in the week, as a cool drizzle fell on lines of immigrants outside the respite center, City Manager Roel “Roy” Rodriguez met with Pimentel in an attempt to help Catholic Charities deal with the higher numbers of immigrants arriving. “We’re just trying to help in any way we can,” Rodriguez said. Whether the numbers will dip or continue growing is unclear. What is clear is that Catholic Charities needs to vacate the respite center on Hackberry Avenue by mid-May per orders from city commissioners. Darling said negotiations are underway for a new facility near the downtown bus station. Also, Darling is asking for federal money to assist the city with the situation that he said is not their problem, but a federal government problem. “If the president is calling this an emergency, then we should be eligible for FEMA money,” Darling said, adding that he has been in touch with the South Texas congressmen. Also in the loop potentially assist are the two U.S. Senators from Texas, who met with Chief Victor Rodriguez of the McAllen Police Department on Wednesday in Sarita after the Border Patrol checkpoint was renamed in honor of slain agent Javier Vega Jr.
Sens. John Cornyn and Ted Cruz met with Rodriguez and Hidalgo County Sheriff Eddie Guerra for about 10 minutes. Darling is hoping the senators can help, too. “This could end up costing us a chunk of change, so we’re trying to get help from Washington,” Darling said.